In September of 2017, Michael Nawa celebrated his 40th year in the sweeping and maintenance business in a markedly different fashion than he had celebrated any of the previous anniversaries: he sold his company, Pennsylvania-based Custom Maintenance Services. 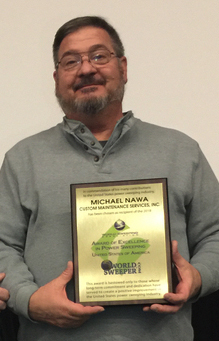 We held an audio interview with Nawa prior to his designation as the 2018 winner of the WorldSweeper.com/World Sweeping Association Award of Excellence in Power Sweeping, long the U.S. power sweeping industry’s highest honor. The highlights of that audio podcast are shown below. To hear all the details, we invite you to use the link at the bottom of this article to access the podcast. “In 1976 when I graduated from high school,” says Nawa, “I had no interest in going to college even though that’s what one was supposed to do. I knew I wouldn’t succeed at it. Cutting grass was easy to do and something I could make money with so I started a small landscaping company with about $5000 that my father provided. When asked if the reason for his company’s growth and success was because he was a good manager, though, Nawa said that wasn’t particularly the case at all. Rather, he said he was a good salesperson and knew how to hire a good manager. The company’s first sweeper was purchased in 1978. It was a used 1976 Schwarze Mini-American, which was a round tank sweeper on a half-ton Chevy chassis outfitted with a two-yard hopper. It did not dump; rather, it had Dutch doors in the back that allowed somewhat easy shoveling out of the debris. The lower doors could be left closed, which allowed trash bags to be dumped in via the top door. The sweeper had a standard Schwarze sweeping head with a hand-crank winch to raise and lower the head. There were no inside controls: The operator had to get out of the truck to do everything, from starting the engine to cranking the head up or down. There was no gutter broom or clean air blower of any kind, either. New at that time the sweeper cost about $27,000 and as a two-year old machine it was purchased for $7,500. Initially, says Nawa, they bought the sweeper truck to clean up after their landscaping crew in order to more easily get grass clippings off the pavement. However, since the Mini-American came with two small accounts, it provided an introduction to the business of parking lot sweeping. Back in those days, Nawa reported, he estimates that fewer than half of the property managers he contacted were currently hiring someone to sweep their parking lots. Nawa purchased another small sweeper company several years later, which added a Tennant to his ‘fleet.’ By about 1984, the volume of sweeping revenue had eclipsed that of landscaping and maintenance. To give readers an idea of what sweepers were like at the time, Nawa recalled that by about that same time sweepers started to be mounted on cabover trucks. However, there were no automatic transmissions yet available for them. Nawa says they waited until automatic transmissions were available before they bought the company’s first cabover sweeper, which had a curb broom mounted on the front bumper because the wheelbase wasn’t of sufficient length to mount it elsewhere. Mounted upfront like that, where it was exposed to damage, the curb broom didn’t last nearly as long as the sweeper. Nawa recalls those years as ones with lots of ongoing innovation in sweeper design. Access doors started being available on the side of the hopper, which allowed random large debris and trash bags to be tossed into the sweeper hopper. Early sweepers came with no way to replace the fan, fan housing or bearings, since they were all welded on. If your bearing went out, that was the end of the sweeper. It was a great innovation when all of that fan system started to be bolted on instead of welded. Both Schwarze and TYMCO were innovating rapidly, with each of them upping their game with each successive model. The result can be seen today with the magnificent sweepers that are out there. Yes, they are expensive, but they do a superb job and their machines last a long time. Nawa’s company still has 2006 sweeper trucks that are in daily service, as an example. Another consideration no longer faced by today’s contractors is that, in earlier days, no one would finance a sweeper. “I was told routinely by finance companies,” said Nawa, “that there’s no way they could give me a loan because they had no idea why people would pay me to use such a machine. The financing industry simply didn’t understand the sweeping industry. “Getting insurance was also a problem; typically, the underwriters for any insurance program would have to come to the shop and see for themselves what we were even talking about. Like many customers of the shopping centers we sweep, the insurance people are in bed when we go out to work and they had never even thought about the fact that parking lots were dirty at night and clean in the morning. When asked for examples of the kinds of advice he would offer to other sweeping contractors from his perspective after being in the business for 40 years, here is what Nawa had to say. “First off, I’ve never been a great manager and feel that part of my success has been being personally involved in sales and customer support while, at the same time, hiring strong management personnel. I think there are more people who can manage a company well than there are people who can sell the services we provide. “I’ve done seminars for sweeping contractors from the early days of what was then called the NPME, National Pavement Maintenance Exposition, owned by a man named Bob Woltering. I think Bob owned the NPME for perhaps 10 years. Being involved in what later became the National Pavement Exposition has allowed me to up my game through the years, keeping up with the latest trends in equipment and methods. “(As of the time this interview is being conducted in early 2018) I consider this to be a very challenging time to get into the sweeping industry, especially the parking lot side of it. The fact is, they’re not building any more shopping centers or at least they are building them very slowly. In times past, a few investors would get together and build a shopping center or two. “Today, conglomerates may own hundreds of centers, all of which are just numbers on paper. If they’re not meeting their revenue targets or when taxes are due, often times maintenance just gets set aside. Potholes don’t get fixed right away, they don’t stripe every second or third year; preventive maintenance can be put off for half a decade or more. I’m sorry to say I do not believe our industry has the same growth opportunity as it had 20 years ago, at least in the retail side, the market I existed in. We are serving a dying client base that is experiencing enormous competition from online retail. “As shopping centers lose their tenants they also lose their ability to pay the same amount for keeping their properties clean and maintained. Some experts predict that 25% of shopping centers will close within the next five years. Many other large retailing centers will be squeezed between their need for keeping their properties looking good and well-maintained and remote accountants who will determine the revenue coming in doesn’t allow for that to happen. Unfortunately, when it comes to the pavement maintenance side of things, many property managers don’t budget for capital projects that need a major investment some years ahead; rather, they only budget for the current year’s expenses. “For the future, I believe diversification will be key to financial success in the parking lot sweeping industry. My own diversification came in the 1990s as a result of a seminar by a man named Harold Greene, owner of Maryland-based Chamberlin Contractors. His message was that if you are a single service provider you are at risk of being replaced by people who do more than one thing. He emphasized that the people running shopping centers do not want to make 50 different phone calls for the 50 different things they need done. “In fact, it is that very sentiment that has given rise to the third-party providers that have become so prevalent. If you think about it, that is their exact message: Give us a call and we will get anything done that you need, from painting the building to graffiti removal to cleaning up broken glass, etc. The reason that message is so attractive is the person who used to be running several centers may now be running two-dozen of them. Nawa says that his theory of sales has always been meeting face-to-face. Even if he has to travel substantially in order to meet the person in charge of the properties in his area, he will do so. He’s found that most contractors will wait until the property manager visits the site and make an appointment to see them then when they can make a 10-minute pitch. He also cautioned against getting out of the market you know: “As we expanded via providing additional services, from of our 20-year position of knowing our retail marketplace, we found ourselves in warehouses, industrial parks, apartment complexes and other areas that were, frankly, outside our area of knowledge. Ultimately, we came back to retail because that is what we knew. When asked to comment on the topic of the best ways to keep sweepers in top operating condition, Nawa said that, to him, it depends on the quality of commercial repair work available in your local area. Sometimes, if you have people who are doing a good job on your sweeper and chassis repair, then it doesn’t pay to bring a mechanic in-house. If you are not mechanical yourself, then it can be difficult to even know whether you are hiring someone who knows what they’re doing. At some point, though, when you have enough equipment in service it typically makes more sense to hire your own mechanic. “We’ve had situations where we made appointments for minor work to be done on our sweepers,” said Nawa, “where we took the sweeper in at our appointment time of 9 AM on Tuesday and needed that machine at 6 PM that night. Then, when we called about picking it up we find they didn’t ever get around to repairing it or didn’t get it finished as they said they would. Those are the kinds of things that point you toward an in-house mechanic. Nawa provided a caution during the interview about lowering your prices when a competitor comes in with a lowball offer per sweep. “If a competitor comes in at $25 a sweep on an account where I’ve been getting $40 for the last eight years and the property manager calls wanting me to match that lower price, if I do so I am, in essence, telling the property manager that I have been stealing $15 a night from him for many years. “In those situations, I believe it is best to reiterate the quality you are currently providing and tell them it is simply not possible to provide the same level of quality at the lower price. If they do decide to switch providers, never close the door to them coming back to you because, in our experience, we eventually got back all but one of the accounts we lost to that sort of situation. “We are the company that people call when they need their problem solved. There is absolutely no problem so small that I’m not willing to have our company handle it and send them a bill for doing so. If you need someone to go turn the lights on at a center, or unlock a door, or whatever else it might be, when you call our company you will get a timely response. However much time it takes, you then bill them at your current hourly rate, which is probably up around a dollar a minute for services. Just charge them a labor number based on your current labor rate. “You have to know your costs, though, in order to come up with your labor rate: What do your trucks cost to operate, what is your wage rate, etc. Remember that if your worker is being paid $15 an hour then your overall labor cost is probably three times that. You have to learn these fundamentals; otherwise, your labor rate is the total amount of revenue divided by the number of hours you worked last year. That doesn’t cut it. Michael Nawa has the title of ‘Mentor in Chief’ at the World Sweeping Association. Through the years he has assisted many contractors in improving their businesses and, even though he has now sold his company of 40+ years, says he remains ready to keep on assisting if he can. If you have questions for him, feel free to contact Nawa at the phone number or email address shown. The audio podcast with Michael Nawa, which is approximately 60-minutes in length, is linked at the bottom of this page. Michael Nawa may be reached on his mobile phone by calling (717) 440-2320. His email address is mnawa@comcast.net.